ein gutes album! nicht jeder song ist ein kracher, aber insgesamt ganz solide. I'm surprised by how much I enjoyed this album. I wasn't sure what to expect, We Are Done got on my nerves due to overplay and Dear Jane was good but slightly underwhelming. The further you get into this album, the more it begins to sound like the stuff I loved from the mid-2000's, that made Good Charlotte my favourite band at the time, and they pull it off quite well. There's no overproduction which is a nice surprise as well. 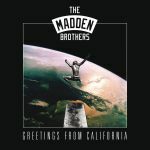 Good album, and a return to form for the Maddens. 4.8/6.